Every day we wake up and make a conscious effort to minimize the negative impact we have on our planet. It is our goal to set an example for everyone who comes into contact with us, whether by vendors, competitors, or customers. We work to encourage all food vendors to purchase from farms that responsibly raise their vegetables and animals. We encourage our competitors to mirror our business practices to provide a higher quality experience for their guests. We encourage our customers to visit our website to learn how to live more efficiently. We pledge 100% organic beef that only comes from grass-fed cows that lead comfortable lives. We pledge ingredients that are NON GMO certified so that what mother nature intended, is all that goes into our bodies. We pledge sustainable business practices that increase efficiency and reduce waste. Our shelves are made from wood that was pulled from the Dearborn railroads when the Dearborn Amtrak Station was being renovated. The beams were originally installed in 1884 and the wood was 150 years old at the time; which makes each beam currently over 250 years old. 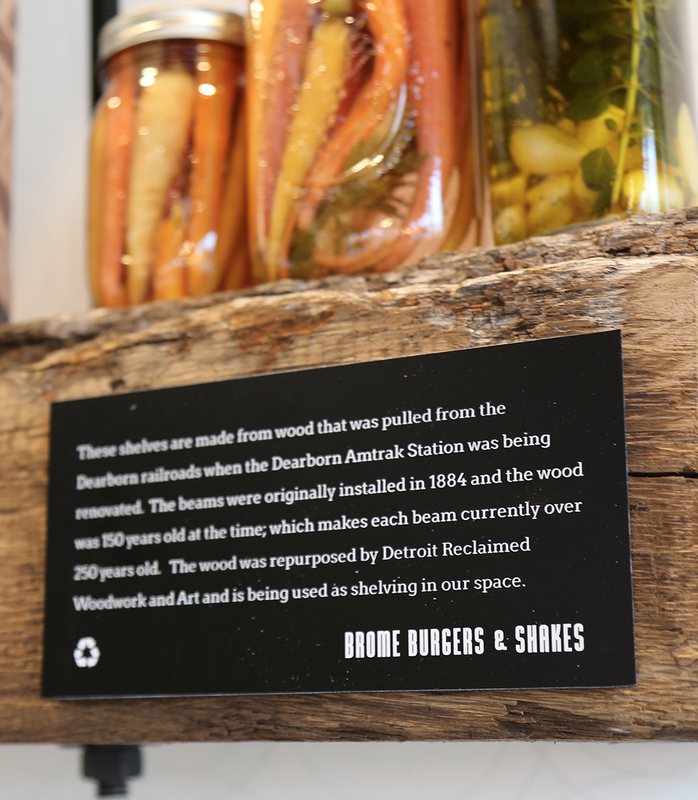 The wood was repurposed by Detroit Reclaimed Woodwork and Art and is being used as shelving in our space. ©2018 Brome Modern EateryTM. All Rights Reserved 2018.